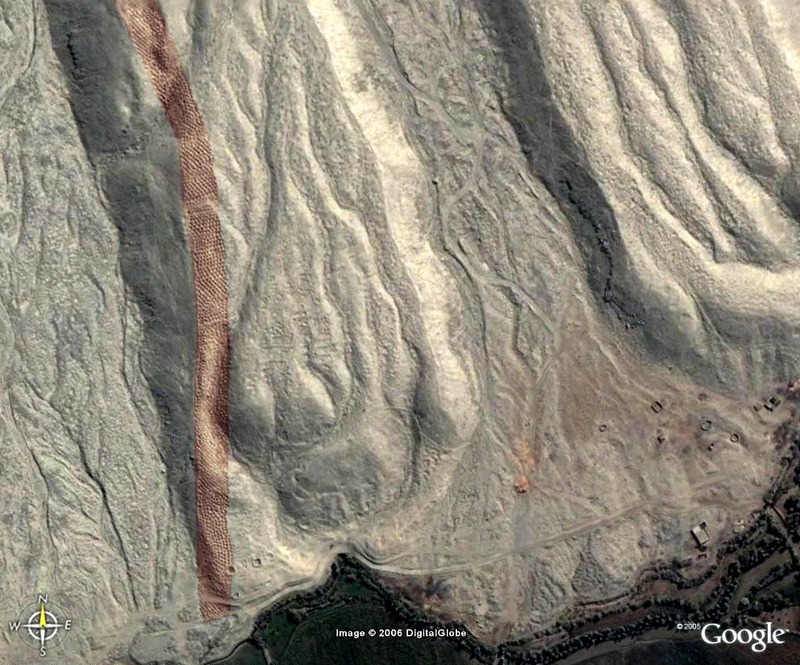 Most people know about Nazca Lines however another, less known, unexplained mystery in Peru is located near Pisco Valley on a plain called Cajamarquilla. Thousands of man-sized holes are carved into the barren rock. 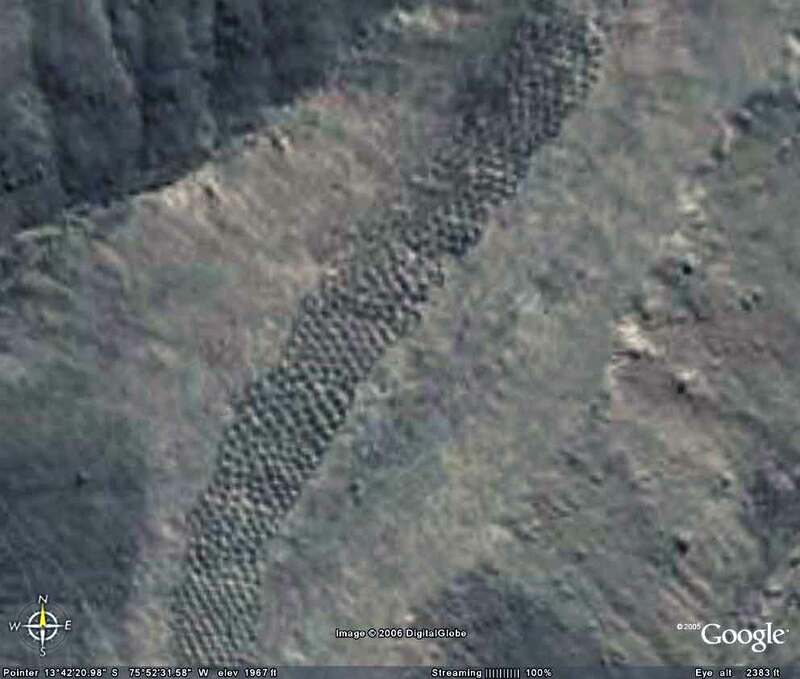 These strange holes, stretching for a mile over uneven mountain terrain, were here for so long that the local people have no idea who made them, or why. Funny thing is no one really saw the big picture until the area was seen from the air. Archeologists have speculated they were dug to store grain in. Two problems with this, say the folks thinking out of the box: there were a lot easier ways to create storage containers than the hard work and decades it must have taken to chip out all of these, and it would have made more sense, if these were to store grain, to build several huge chambers. Ok, said the archeologists. Perhaps they were used as one-person tombs? Vertical graves of some sort? But no bones, artifacts, scraps, inscriptions, jewelry...not even a tooth or strand of hair has been found in them. They have no covers to seal them as you might a tomb and no sacred history or even myth was passed down to label them as such. Some sections have holes in rigid and perfect precision; some run in rows that curve up in arches, some staggered lines. They vary in depth to about 6-7 feet deep yet some are merely shallow indents as if not completed - though surrounded by those that are. To date, no one has a clue why they're here, who made them or what they were. 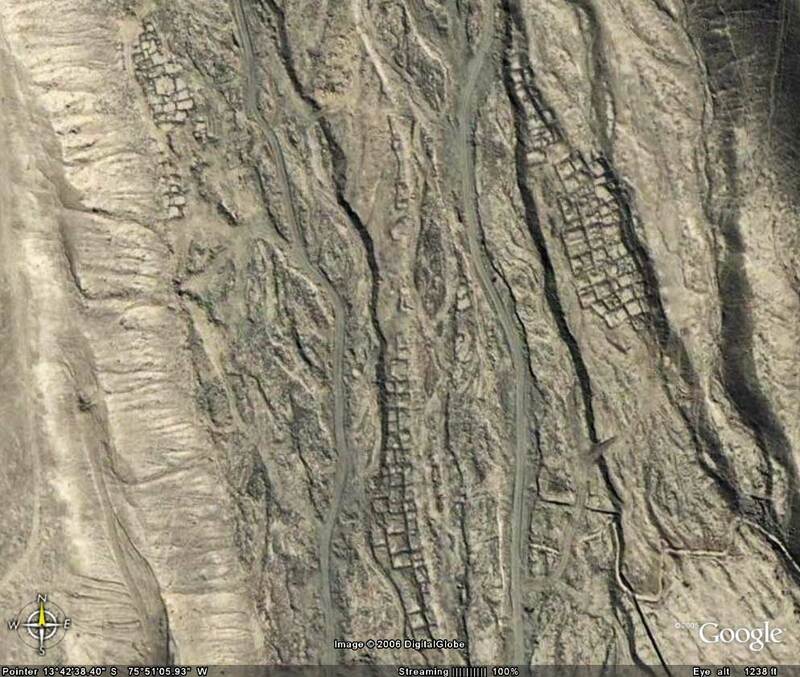 Thousands of man-sized holes are carved into the barren rock near Pisco Valley, Peru on a plain called Cajamarquilla. Click on the image to enlarge. the "Band of Holes" . Click on the image to enlarge. 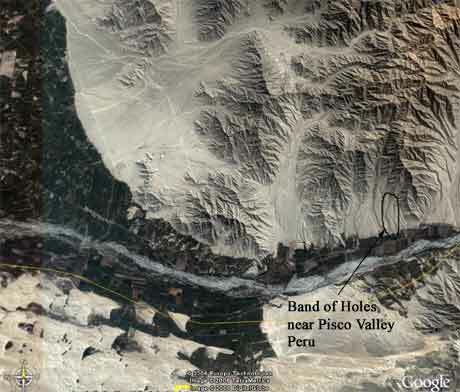 Satellite photo of the "Band of Holes" near Pisco Valley. Even von Daniken's work begins to take on a realness when one finds an old National Geographic from 1933 corroborating the "Band of Holes," that he personally inspected a few years ago. Each hole is a meter wide and just as deep. 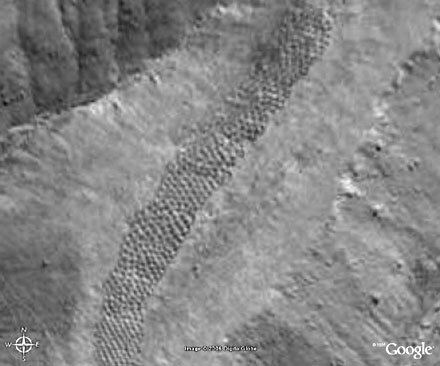 There are eight holes spanning 24 meters in width, marching in repetitive uniform fashion, from the Pisco Valley rolling over a mile through mountain terrain -- finally disappearing in the misty mass of Peru. 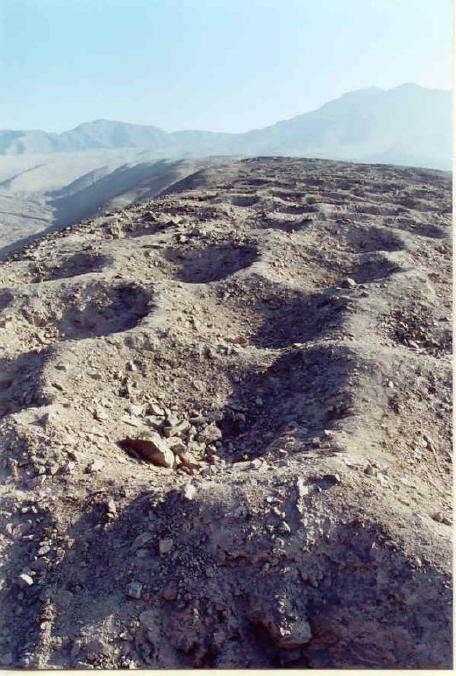 These holes remind this old West Texas boy of the traces left by a massive drilling rig moving along methodically, testing the geology of the Andes for precious metals. Lasers have also left such tracings in the ground. Archaeologists say they represented defensive positions or graves for the ancient ones, except why would you bury anyone on a slope in rocky soil at more than a 45-degree angle? Strangely dark area where the "band of holes" ends. Remnants of an ancient city? Ruins of Machu Picchu, Peru (click to enlarge). Some years back, I had the pleasure of having a visit from my esteemed mentor -- Leon Brown. He has spent most of his life researching historical manuscripts from ancient times and is currently seeking to conquer the Mayan glyphs for their secrets of Mesoamerican history. We stayed up until the darkest hours of the morning discussing all the study he has conducted over the past 30 years. From what he and I have gleaned through together, a rather large body of work could be attained in short order. The over-riding point that seemed to explode upon our collective conversation was the fact that the national academic presentation of what brought mankind to its present position in time is all an illusion. New evidence is being held out by the powers that be for perhaps no other reason than slothfulness. Professors and scientists just do not want to mess up their nice little world of academic calm. We were both once in that academic realm and saw it all. The real truth would mess up everything. So what if the company-line is wrong? What if there is evidence that humanity was once just as advanced or more so than we are today? What if flying machines, cars, computers, radios, televisions, nuclear weapons, lasers, spacecraft, advanced medicine, genetic engineering, and master-building-design were representations of a civilization like ours only it was firmly held in the hands of the very rich and the politically-powerful elite? Few examples of their works would survive perhaps none other than their philosophy. They ruled the earth via technology, fear, and supreme intelligence. They could prolong life and discovered the secrets of being and becoming. Compared to common man they seemed like gods and positioned themselves accordingly. Could our civilization be polarizing in this direction now, with the rich getting richer and the poorer masses exploding toward obscurity? What happened when the Ice Age came to a halt and all that glacial weight melted into the oceans flooding mass-civilization into obscurity? 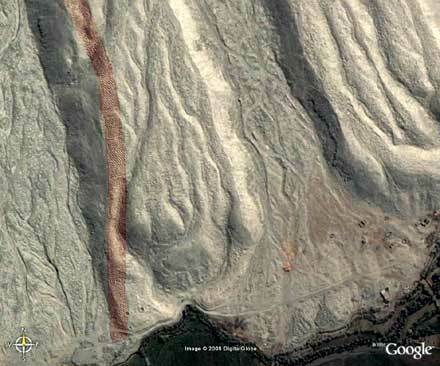 Like a giant waterbed, the surface of the earth changed drastically. What was lost under hundreds, perhaps thousands of feet of mud and historical ooze? Is the evidence still to be found off the shores of present humanity? Did the so-called gods escape to the highlands and wait to return when it was all over? This small but highly aware power-group may have ruled on the Earth some 10,000 to 15,000 years ago (some say more). The evidence of this epoch setting period does exist everywhere, and it is reinforced more every day by the finds of archaeologist, anthropologists, and other scientists. The truth of some of their work never reaches the public ear however, because it would require a gestalt paradigm shift for most of us to even understand the implications of such enigmatic data. Instead, we are offered the preliminary-spin from cautious minds not able to entirely perceive the real meanings behind the remains of Earth's past history. The accomplishments of ancient man are many and powerful when one puts away the weak assessments and lack of creative thought by the learned experts from the elitist institutions and universities. It is as though there is and was a conspiracy among these folks to hide the truth of an incomprehensible civilization that has always been kept hidden behind a facade of fertility-cults, ancestral worship, astrology, savagery, cursory bloodletting and other forms of supreme underestimation or outright concealment of ancient capabilities and intellect. The reality and mythology of the past is out of focus with academic assessments of actual artifacts. The collective scientific community seems to support one another in a common "story" about our past. Are they afraid of the truth or do they protect something much larger? Perhaps they protect themselves. Zecharia Sitchin has taken a scholars approach to an Eric von Daniken-like theory of our past. He has torn back the veil of Isis to expose the possibility that we did and possibly still do, have gods of super advanced technology living among us. He has presented evidence of the Anunnaki, who were human-like beings from the planet Nibiru (planet "X" 39 au away, currently coming into our solar system?) living on Earth for perhaps half a million years. He has gleaned this evidence from the ancient records of the Sumerians, Egyptians, Hittites, and the Tiwanakuans of Lake Titicaca of Bolivia (before the Inca). His work is collected in THE EARTH CHRONICLES, a series of books dedicated to deep research into the why of such magnificent engineering accomplishments as the Great Pyramids, Baalbek, Teotihucan, Tower of Babylon, and much more. Even the Bible offers this information, yet many see it in the light of a lesser gestalt-paradigm. Many of Sitchin's questions have gone unanswered by today's scholars who prefer to explain away phenomenal engineering feats in the simplest of terms. For anyone who has actually seen the sites such as the Great Pyramid of Egypt, the markings that run dead-straight for eight miles in the deserts of Nazca Peru, or even the beautiful constructions in Mexico--some of the puny conclusions by scholars seem totally out of context with the evidence. An example -- some years ago the Japanese tried to construct a 35-foot tall miniature version of the Great Pyramid, which is almost 482 feet tall. In the end they had to resort to modern earth-moving and lifting technology which ultimately could not do the job. Modern man had to abandon this attempt to emulate ancient man. The Great Pyramid is 2.3 million blocks of 5,000 lb. perfectly dressed stone. Scholars suggest that the Egyptians would have had to position 6.7 stone blocks per minute in order to build the limestone structure in the 20 years calculated for the construction. If this were true, forces greater than any I am familiar with would have had to be used. In the fortress at Baalbek in Lebanon, the use of 1,000 ton monolithic stones pique the interest of any thinking engineer of today, especially one who wrestles with 150 ton beams. Of course, there are thousands and thousands of unanswered questions like the above. Even von Daniken's work begins to take on a realness when one finds an old National Geographic from 1933 corroborating the "Band of Holes," that he personally inspected a few years ago. Each hole is a meter wide and just as deep. There are eight holes spanning 24 meters in width, marching in repetitive uniform fashion, from the Pisco Valley rolling over numerous miles of hills and mountains -- finally disappearing in the misty mass of Peru. 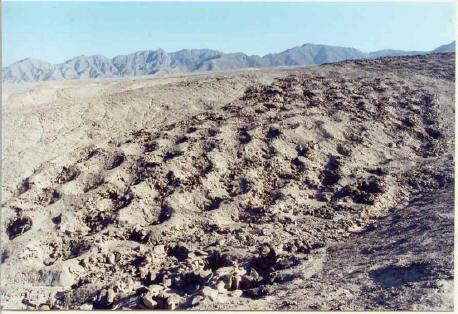 These holes remind this old West Texas boy of the traces left by a massive drilling rig moving along methodically, testing the geology of the Andes for precious metals. Lasers have also left such tracings in the ground. Archaeologists say they represented defensive positions or graves for the ancient ones, except why would you bury anyone on a slope in rocky soil at more than a 45-degree angle? But my friends, there are tons of anomalies in the mysterious lands of South America -- Colombian models of delta winged forms, giant pyramids in the Amazon Basin, built on mountain slopes covered by inaccessible jungles and others are examples. Are these mysteries part of why Teddy Roosevelt was so introspective upon his return from the Amazonian adventure which eventually caused his death? This is an area where satellites from space represent the best vehicles for discovery of the great structures or patterns on the ground. The Amazon hides "tall, robust" civilizations of the past, which have been radio-carbon dated just recently to over 8,000 years old, and it seems we have not even scratched the edges of this area's massive hidden potential for learning the true "why" of its humanity. In Bolivia, the archaic site of Tiwanaku on the shores of Lake Titicaca, represents one of the greatest question marks for all mankind. Here are the remains of a city with one of the most sophisticated sewer systems for even modern times. According to archaeologist Alan Kolata from the University of Chicago, he has never seen or heard of a better system. His awe is also taken by the remarkable agricultural system of canals and hydraulic systems that he is even now using to increase potato production for area residents. The raised field system used by the ancients must have occupied 400 to 500 square miles and could easily have fed the 100,000 or more ancient residents living on the arid Altiplano. Kolata and Oswaldo Rivera of the Bolivian National Institute of Archaeology are currently excavating this great area which includes 2.5 square miles of an advanced form of building. There are pyramids with some interlocking stones weighing 160 tons. Many of the structures offer interior hydraulic systems that control water, which runs under and through the massive structures. It has been said that this site contains the biggest stone-built buildings in the Americas and everywhere archaeologists are finding that the concisely cut stones are interlinked by copper clamps to hold them together. Not even the more recent Inca culture knew to use the clamps. Many of the structures also use the interlocking stone work, which is famous in Peru, but a different twist is found in evidence at Tiwanaku. These stones resemble the work of a master gunsmith, with complex breach-locking levels and sophisticated cuts that have never been seen in any other ancient culture. No written language has been found but unusual designs that compare to configurations of today¹s computer chips have been unearthed. How did these geniuses of engineering, make do without a written language? If humankind could suffer a gestalt paradigm shift, thus enabling us to see anew the reality of what we are now discovering about life on Earth and the Universe, then perhaps we would realize that we have been here before. Some ancient records say that this is the 5th round of existence that we are experiencing. Cycles are in evidence everywhere in nature and in mathematics. Could the past records of Earth finally push human intellect beyond the little minds that we are now perceiving life through to a higher level of understanding, thereby letting us spring from the pedestal of this planet into the oceans of new learning that wait for us to finally arrive...and, when we do, will we know the territory when we see it? I was sitting here, twiddling my thumbs, and quite providentially, your article arrived for my inspection. Thank you. It is nice to have something to think about. And you say you are contemplating its inclusion in The Mystica? Bully! And since you invited comment on the article, yes, I do have some comments to make. I am reminded of Ales Hrdlicka, who was with the Smithsonian in Washington for so many years. His particular mindset was that man could not have been in the Americas before the end of the last Ice Ages, due to the gargantuan ice sheets, which would have impeded mans progress into the New World. He defended this position to the point where it was academic suicide to go against it, and all quailed in fear of his wrath. This man was able to impress his notions on the anthropologists of the Americas for decade after decade. It was nothing except intellectual tyranny. Professor Hibben lost his tenure, and he was booted out of the University of New Mexico. His professional career was completely ruined, and he never taught again. He was vilified beyond belief, and it was even suggested that he had tinkered with his evidence. However, let it be noted that no one went to look at the evidence in situ, where he had carefully left half of the site intact for study by future scholars. In fact, someone went out to the Sandia Cave and completely vandalized the site so it could never be studied again. (How is this for spite and malice?) Well, the poor man was ruined, but there was a saving grace. He was married to a very beautiful woman who loved him devotedly, and she was also very wealthy. He lived the rest of his life in luxury in a lovely section of Santa Fe. His material needs were taken care of, but I am sure that he was saddened by the loss of his professional life and interests. And then what happened? Hrdlicka finally died, and who was the wag who observed that Science progresses from funeral to funeral? They then discovered the Monte Verde site in southern Chile, which proved that man was in the Americas long before the last Ice Age ended. It was amazing how many archaeologists went to the site before they could be convinced of the truth. After they were finally persuaded, then it was equally amazing how many pre-Ice Age sites were discovered and are being excavated. A theory had fallen, and a mind set had been conquered. Please pardon me for going on at length about Professor Hibben, but it exercises me no end. I am not sure that this good man is still alive, but at least, he lived long enough to see the archaeologists validate the Monte Verde site, and surely that must have pleased him. I also noted in your article where you ascribed a high level of technological development to the ancients. I would like to discuss this someday, because I think that you might ascribe a higher level of technological development to ancient Man than I do. Let's talk it over, and maybe we can get an argument going? Proceeding briskly onward I think you are quite correct in your assumption that learning remained in the hands of a few in ancient days. Indeed, this practice persisted almost until modern times, because only the affluent could afford the benefits of a solid education. We have now gone for over a hundred years with education and look where it has taken us. The GI Bill after World War II produced a cadre of well educated and well trained people that rapidly took us from the Industrial Age into the Technological Age. And now we have entered the Super Tech Age. Since weight was being redistributed on the planetary surface, the natural consequence would be earthquakes and volcanic eruptions of a gargantuan nature. It must have indeed been a dreadful period in our history. I am still trying to come to grips with the collapse of the Laurentide Ice Sheet. It is indeed difficult to conceive how something so gargantuan could degrade and then just collapse. Ditto for the Fennoscandian Ice Sheet and the ones further east. I beg you to review pages 70-86 of Underworld by Graham Hancock once more. I regard the first 86 pages of the work to be the most productive of the entire book. However, I do endorse the value of the remainder, and I firmly believe the secrets of prehistoric civilization are to be found with underwater archaeological research. Hancock is to be commended for continuing research in the oceans of the world. You asked for a commentary? You got a commentary! If there is anything you can use, then fine with me -- have at it. I don't really care. I just wanted to blow off a little steam on the subject. The Cerro Cora range is a ring of mountains about five kilometres in diameter and 25 kilometres west of the modern town of Pedro Juan Caballero. It lies within a national park and a prohibited military zone. At one time in the past the area had been sub-tropical afforested jungle. 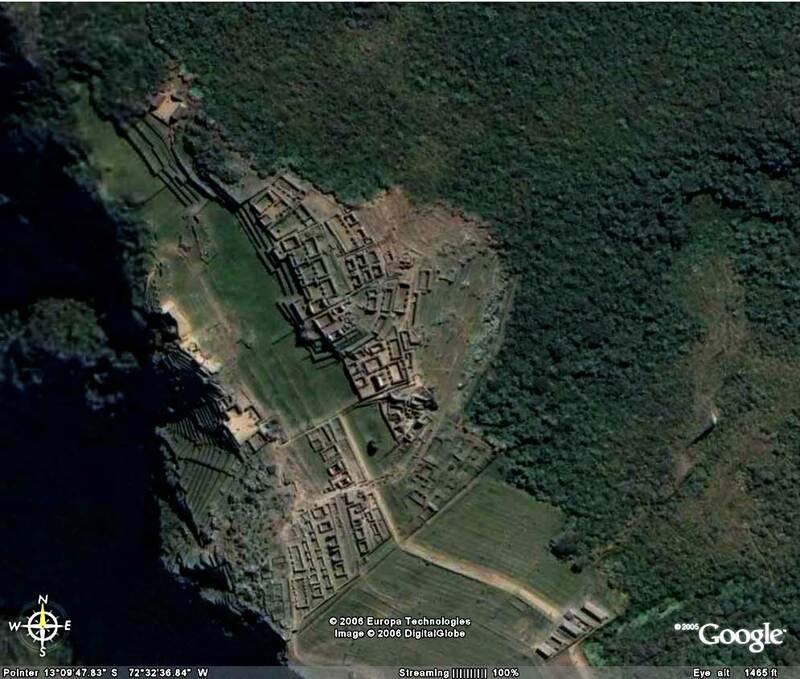 A straight ridge to the north-east is Cerro Itaguambype (a Guarani word which means "fortress") . It is two kilometres long and 100 metres in height in relation to the interior plain, aligned north-south and on its crest has a path 300 metres long and three metres broad. At the south end of this path is a rounded raised platform and the ruins of a watchtower. About thirty metres from the south end of the path is an opening 20 metres wide leading into the interior of the mountain. The base of Cerro Itaguambype is natural rock to which vertical walls had been added, and where necessary the natural rock tailored vertically. The walls are constructed of stone blocks of unequal size but fit into one another for a smooth surface. This method of construction is exactly similar to pre-Inca walls in Peru and Bolivia where the irregularity is a deliberate defence against seismic movements. Since Paraguay is not an earthquake zone, it seems logical to infer that the method must have been imported, for the native Guaranis never built in stone before the Jesuits arrived in Paraguay, while the Jesuits followed a different style of building and never settled in the area. The men who built this wall must have learnt the technique in the Andes Altiplano and prior to the founding of the Inca empire, since the procedures were lost after the fall of Tiahuanacu in about 1290. Over the period 1940-1944 this mountain was thoroughly investigated by AGA, and again by the Instituto de la Ciencia del Hombre professors thirty years later, but until very recently nothing was ever revealed as to what was found in its interior. In the last interview before the professorial team-leader's death in 1990, he revealed to the Delphos Foundation of Argentina, an organisation interested in pre-Hispanic history in South America, that the interior of the mountain had contained "a silver-resmelting plant". Here is the first mystery. What classified secret could possibly exist about a 13th century silver re-smelting plant in a remote mountain of Paraguay? The second mountain in which Fritz Berger had a particular interest lies within five miles of the first, no more than forty metres in height, a rocky hump with a central depression, covered over its lower regions with dense vegetation and above it with none, and thus called by the Guarani natives "Yvyty Pero" - Bald Mountain. Later it was renamed "Cerro Ipir" by the Paraguayan Government. Curiously, there is a similar mountain with the name "Yvyty Pero" 300 miles to the south, at the foot of which archaelogists have found some splendid runic inscriptions. Where Berger gained the conviction that Bald Mountain was so important is not known, but he became convinced that the hill was a tumulus and contained a subterranean palace built around the funeral chamber of a Viking king. He used a "metal detector", an instrument impossible to identify but which two AGA soldiers, an officer and a sergeant, have testified "looked like a theodolite with a large clock which Berger used to detect different metals." A shaft was found in the depression between the two humps of Cerro Ipir, and here the theodolite-clock indicated the presence of gold. Excavation work began and two items were soon discovered: a triangular pice of gold "which looked like the broken corner of a table", and then a staff decorated with a gold hand. Winter rains hampered the work which had proceeded no deeper than 18 metres by the end of 1941: by the end of 1942 a pneumatic drill had been brought in and a ventilation shaft sunk obliquely to meet up with the first. At 23 metres calculated from the head of the vertical shaft, the drillers encountered a continuous slab found impossible to break. The bits of the drill broke off one after another. Explosives did not even scratch the surface of what Berger considered to be "the roof of the palace". The witnesses stated that the material was undoubtedly artificial, and infinitely more durable than cement. Berger stated that it was "a superior Portland unknown to modern science". A third attempt was undertaken in 1944 about 10 metres up from the base of the hill and an outer wall discovered which bore an indecipherable insciption, its characters eroded but definitely not the Latin alphabet. The strange cement of the wall impeded any further progress and the project was then abandoned. Besides the two gold artifacts mentioned above, the AGA team also found "a 14 x 10 cm plaque, unidentifiable for certain as stone or metal, brilliant as diamond" which Berger mentioned in a letter in 1941. There were also various representations of heads, some amphoras, other artifacts "of high artistic value", some found in the rubble, others set out "displayed as if in a museum." These included the figurine of a woman 1.2 metres in length "of alabaster or porcelain of the finest kind" found buried, suggestive of a recumbent statue from a mediaeval sepulchre, and two dice bearing the images of persons unidentifiable but which in structure were "similar to worked diamond." The subsequent whereabouts of these items is not known. Fritz Berger spent considerable time in making a survey of the ridge. "It is very big, " he wrote in October 1941, "and I have not been able to estimate it completely. It is probably 80 components, perhaps more. I have found it interesting to see how these people worked geometrically, to the centimetre. I found polygons so exact, from the arithmetical point of view, that the best of engineers could not reproduce it. Today when they dynamited inside the shaft, at a distance of some 200 metres I felt the vibrations in the cavities below me." When the professorial team investigated the hill in 1977, at first glance archaeologist Professor Pistilli reported that nothing about the hill suggested a tumulus. On further exploration, the shaft and trenching were found intact but poorly preserved. After having seen a five-character undecryptable runic inscription on a wall, the runologist continued the excavation to the concrete inner wall. 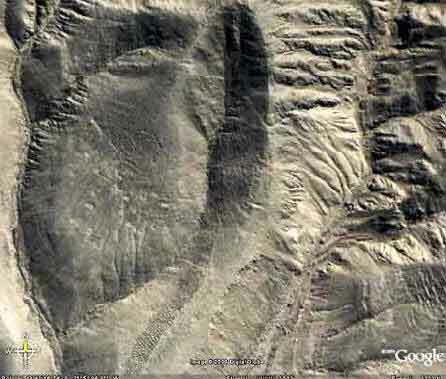 This was a whitish shade and contrasted with the reddish sandstone of which the ridge is composed. It was found impossible to chip or even mark the material in any way with a pick or geologist's hammer: the interior sounded hollow. To determine whether the underground construction had the extension which Berger alleged, small explosive charges were detonated. It was noted that the vibrations radiated outwards at the same speed as in normal atmosphere to the 200 metre mark, the distance indicated by Berger; beyond that the compacted sandstone had a muffling effect. Efforts to find the entrance to the subterranean chamber were undertaken with teams of sappers, but could not be discovered. In his letters to Munich in 1940, Berger stated having found the entrance to four tunnels, the location of which he was not disposed to reveal. These were "over 150 kilometres in length" he said: the dimensions were small, each entrance being less than a metre broad and 1.47 metres high. What conclusions can be drawn from the above? Large scale silver-ore mining in the pre-Inca period, begun about 1000 AD, has been proven scientifically by carbon-dating material found in Laguna Lobato at Potosi in Bolivia. 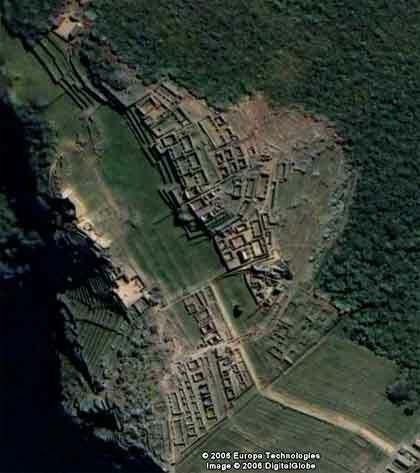 Findings published in the journal Science of 23 September 2003 confirm a major technology for its time, partly destroyed later by extensive Spanish plundering. Dr Mark Abbott of Pittsburgh University stated that the Potosi silver industry was "up and running from about 1000 AD", but who was responsible for it, and where the silver went, remain a mystery. The obvious answer is that the Potosi silver mines were run by the Vikings, for whose presence in the region from the tenth century onwards much physical evidence exists. They are the leading candidates for having mined and refined and smelted the silver at Potosi. But here is our mystery. If it was then shipped from Potosi down "the soft track" to the mountain fortress at Cerro Cora, why was it re-smelted there? And why was the re-smelting considered a secret to be kept from the reading public of the 20th century? And is this all part of the same reason why the presence of the Vikings in Paraguay seven hundred years ago is also a fact to be supressed? The only certain answer to the silver mystery is that re-smelting would only need to be done at the destination point. One idea that comes to mind is the manufacture of a silver alloy in some mysterious process. The second mountain, Cerro Ipir, provides a possible pointer as to who might have been interested in receiving all this silver. Major Samaniego rose to the rank of general and became Paraguay's Minister of Defence. Of Fritz Berger he said, "Despite his mental aberrations, whatever he said, and whatever he predicted, always turned out to be true. "· Berger must have been psychic, for no other explanation seems logical as the source for his information - "he got it from the natives" appears highly improbable. Unfortunately, respecting the fate of the precious artifacts found at Cerro Cora and to which Berger referred in his letters, all one can know is that they disappeared, and only the managers of the AGA organisation know to where. The identity of the original artisans is likewise a mystery. We might take the easy way out and discount the possibility that such fantastic items ever existed, were it not for the one thing which remains in situ and unexplained - the great subterranean structure which cannot be entered, made of a material which appears similar to that lining the mysterious underground tunnels of Ecuador as described by von Daeniken in his book The Gold of the Gods. Which race of South America centuries before Columbus could construct an underground palace in "a Portland cement far in advance of what we have today", a palace within a mountain extending for more than 200 metres underground, the material of its fabric being resistant to chipping or scratching by every modern drill and possibly by conventional explosives too? None. San Borondon, the strange disappearing island described in "A Pagan Place - I", and Cerro Cora, in Fritz Berger's own words "The Land of the Sleeping Beauty of the Forest" present modern science with a dilemma. In the 1960s, many investigators were agreed on the possibility of a parallel universe, primarily to explain mysterious disappearances of ships and aircraft. In the September/October 1966 edition of the magazine Planeta, French physicist Jerome Cardan reported that since 1965, according to CERN nuclear scientist Robert Gouiran, the United States had been conducting "serious investigations" towards admitting "the existence of at least one other universe co-existent with our own, and that a scientific announcement was to be made soon." In August 1965, Dr J H Christenson of the University of Columbia and a member of the Academy of Science of New York, published in Science Journal an article entitled "Time Reversal" which began: "An audacious hypothesis suggests that there exists a ghost universe similar to our world. There is only a very weak interaction between the two universes such that we do not see the other world, and they do not interfere with ours." After that - silence. The problem for science is that a parallel world is not consistent with the mathematics of Einstein's theories of relativity, the bedrock upon which much of Western science is founded. Einstein is on record as having said that should the existence of a parallel universe be proved, his theories of relativity would have to be consigned to the waste-paper bin, and all manner of anomalies such as UFOs and time travel would become possible. San Borondon and Cerro Cora suggest a parallel universe which can be entered at certain times at certain "weak points" when the "vibrations" change. The repercussions of abandoning Einstein are something which modern science is most anxious to avoid. Ultimately, however, is there a useful solution to be derived from the foregoing for Paganism? In my opinion, most decidedly. The Druid teachings, for example, are based on the doctrine of reincarnation and the knowledge of the deities who preside over the Underworld, an unknown space situated "in continental land or an island". According to Druid doctrine, these localities are where the deceased finds him/herself at the first death. To enter the Underworld unprepared psychically will result in mental aberrations, which probably explains the experience of Fritz Berger. In the third and final part of "A Pagan Place" I would like to explore this avenue, which may be of the greatest importance for Pagans. The Ancient Walls - an article by our new guest writer Richard Nisbet. Another puzzle is mysterious alignment of world's ancient sites. Easter Island is exactly aligned along a straight line around the center of the Earth, with the Nazca lines, Ollantaytambo and the Great Pyramid of Egypt. Other world wonders that are within one tenth of one degree of this alignment include: Perseopolis, the capital city of ancient Persia; Mohenjo Daro, the ancient capital city of the Indus Valley; the Oracle of Zeus-Amon at Siwa; and the lost city of Petra. The Ancient Sumarian city of Ur and Angkor temples in Cambodia and Thailand are within one degree of latitude of this alignment. The alignment of these sites is easily observable on a globe of the Earth with a horizon ring. If you line up any two of these sites on the horizon ring, all of the sites will be right on the horizon ring. 3-D world atlas software programs can also draw this line around the Earth. Start on the Equator, at the mouth of the Amazon River, at 48° 36' West Longitude; go to 30° 22' North Latitude, 41° 24' East Longitude, in the Middle East, which is the maximum latitude the line touches; then go to the Equator at 131° 24' East Longitude, near the Northwest tip of New Guinea; then to 30° 22' South Latitude, 138° 36' West Longitude, in the South Pacific; and then back to 48° 36' West Longitude, at the Equator. The circumference of this line around the center of the Earth is 24,892 miles. Along this line, the great circle distance from the Great Pyramid to Ollantaytambo is 7,472 miles, 30.0% of the circumference. Ollantaytambo is 2,579 miles from Easter Island, 10.3%. Easter Island is 10,096 miles from Angkor Wat, 40.6%. Angkor Wat is 2,490 miles from Mohenjo Daro, 10.0%. Mohenjo Daro is 2255 miles from from the Great Pyramid, 9.1%. In addition to calculating the distances between these sites as a percentage of the circumference of the Earth, the distances may also be calculated in degrees of the 360° circumference, by multiplying the percentage by 3.6. 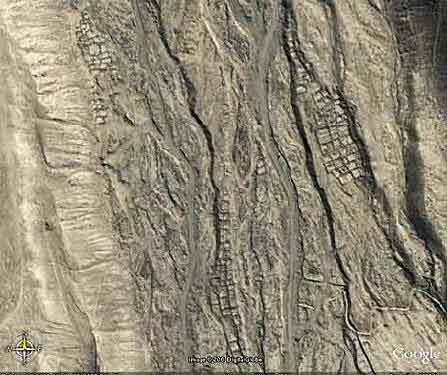 For example, the Great Pyramid is 108° away from Ollantaytambo. Near Ollantaytambo, Machupicchu is within one quarter of a degree and Cuzco is within one third of a degree of the alignment. Ever since the Greeks coined the language we commonly use for scientific description, mythology and science have developed separately. But what came before the Greeks? What if we could prove that all myths have one common origin in a celestial cosmology? What if the gods, the places they lived, and what they did are but ciphers for celestial activity, a language for the perpetuation of complex astronomical data? Drawing on scientific data, historical and literary sources, the authors argue that our myths are the remains of a preliterate astronomy, an exacting science whose power and accuracy were suppressed and then forgotten by an emergent Greco-Roman world view. and the interactions between the two. The mysterious architecture and artifacts, and the enigmatic characters from ancient history are the special focus of renowned European archaeologist, Brian Haughton. His new book, Hidden History: Lost Civilizations, Secret Knowledge and Ancient Mysteries, quenches our thirst for insight into ancient times. © 2002-2010, World-Mysteries.com, All Rights Reserved.